Mashable recently called 2012 the "year of the mobile election." Apps and mobile technology are providing new ways to engage, inform, and connect with supporters this election season. Through the Transforming Communities project, we've rounded up the best of election-related apps. Want to encourage people to vote? There's an app for that. Want to monitor your local elections and help support voting rights? There's an app for that, too! Rock the Vote offers a customizable voter registration tool you can easily embed in your organization's website. Facebook and CNN have partnered to create the I'm Voting Facebook app. The app encourages users to pledge to vote and to share that pledge across their social network. The VoterHub app offers polling location information, sample ballots, and election news and information. The app is available on Android and Windows Phone devices (an iOS version is coming soon) and the same information can be accessed via a mobile web browser at voterhub.us. The Election Protection smartphone app for iOS and Android devices allows voters to register, look up their polling place, review voting rules, and contact Election Protection if they run into any trouble casting their vote. Yo! Philly Votes is an Ushahidi-powered poll monitoring initiative that gathers and maps voting incident reports, such as voter intimidation and long lines. See how other organizations are using technology this election season to get out the vote, monitor elections, and support voting rights. Ever hear a political ad and wonder what that mysterious organization sponsoring it is all about? Wonder no more! Ad Hawk (iOS and Android) and the Super PAC App (iOS) both function a lot like Shazam does for music. Just open the app while a political ad is playing. The app analyzes the ad and provides you with background information on the organization that sponsored it. The Super PAC App also comes in a desktop version. Polltracker for iOS devices provides up-to-the minute access to poll results for the presidential race on a state-by-state basis, as well as information on some congressional and local races too. Major news outlets such as NBC Politics, The New York Times, The Washington Post, CNN, and Fox News offer election (and other) news via their own apps for a variety of mobile devices. All also offer mobile versions of their website, optimized for viewing via your mobile device's web browser. Prefer to listen to your political news and analysis? Stitcher has you covered, offering on-demand access to talk radio shows and podcasts via their mobile app for iOS and Android and via their website. Games aren't just for fun. They can also be a powerful way to inform and motivate political action, and using gaming elements can be particularly effective way to reach youth. The Vote!!! app for iOS turns the presidential election into an interactive fighting game. Choose to play as animated versions of Romney or Obama and battle your way to election victory against your opponent. Vote!!! isn't all just silly fun. The app also prominently displays a voter registration button and links to voting resources. Budget Hero is a web-based game for learning how the federal budget works and understanding how budget decisions are made. MTV's Fantasy Election takes fantasy sports and gives it a political twist. Instead of selecting athletes for your fantasy team, players select candidates. Bonus points are earned by pledging to vote and attending election-related events. Learn more about gamification as an app strategy. Is your organization using apps this election season? If so, please tell us about it in the comments. Or do you have a great idea for an app to help register voters, inform citizens, get out the vote, or protect voting rights? 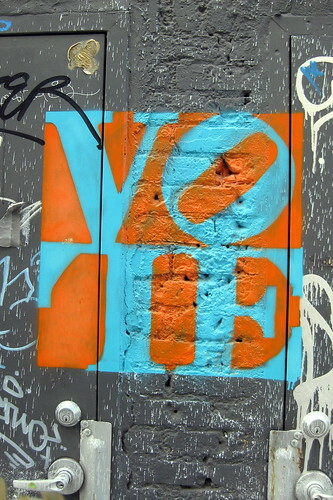 Head on over to NetSquared and share your election app idea.